Tardigrades ('water bears') are the members of the tactopod phylum Tardigrada, part of the superphylum Ecdysozoa. They are microscopic, water-dwelling, segmented animals. Tardigrades were first described in 1773. Their name means "slow stepper". There are more than 1000 different species of tardigrade. Tardigrades have a cylindrical shape with four segments, each with two legs. Each leg has little claws. The biggest adults may reach a body length of 1.2 mm, the smallest below 0.1 mm. Freshly hatched larvae may be smaller than 0.05 mm. Tardigrades feed on plant cells by penetrating the cell wall and eating what is inside. Some tardigrades are carnivores. Tardigrades are eutelic, meaning all adult tardigrades of the same species have the same number of cells. Some species have as many as 40,000 cells in each adult, while others have far fewer. Tardigrades can be found in many habitats: in moss, freshwater, the Himalayas, and the ocean. They are one of the few animals that can be found on the highest mountains and the deepest seas. About 83 percent of the known species live on land, the other 17 percent live in water. Tardigrades are able to live in environments that would kill most animals. In 2007, scientists discovered that some tardigrades were able to survive 10 days in outer space. Tardigrades can survive more than ten years without water. Tardigrates can survive a few hours in temperatures close to absolute zero and above boiling point. Some tardigrades can survive being frozen for over 30 years. Others can survive temperatures of 150C. 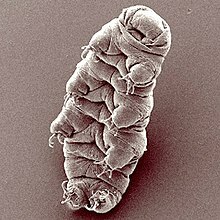 Wikimedia Commons has media related to Tardigrade. ↑ 1.0 1.1 Neuman, Yair (October 2006). "Cryptobiosis: A new theoretical perspective". Progress in Biophysics and Molecular Biology (Elsevier) 92 (2). ↑ 2.0 2.1 2.2 2.3 2.4 Riffenburgh, Beau (2007). Encyclopedia of the Antarctic. Encyclopedia of the Antarctic. 1 (illustrated ed.). CRC Press. p. 983. ISBN 978-0-415-97024-2. ↑ 3.0 3.1 3.2 3.3 Margulis, Lynn; Schwartz, Karlene V. (1998). Five kingdoms: an illustrated guide to the phyla of life on earth (illustrated ed.). Elsevier. p. 324. ISBN 978-0-7167-3027-9. ↑ 4.0 4.1 4.2 4.3 "Tardigrade (animal)". Encyclopædia Britannica. Retrieved 2011-01-02. ↑ Kinchin, Ian M. 1994. The biology of tardigrades. Ashgate Publishing. ↑ Jönsso, K. Ingema et al (2008). "Tardigrades survive exposure to space in low Earth orbit". Current Biology 18 (17). ISSN R729-R731. http://www.cell.com/current-biology/abstract/S0960-9822%2808%2900805-1. Retrieved 1 January 2011. ↑ Whalen, Joann K.; Sampedro, Luis (2010). Soil Ecology and Management (illustrated ed.). CABI. p. 73. ISBN 978-1-84593-563-4. ↑ 9.0 9.1 Grimaldi, David; Engel, Michael S. (2005). Michael S. Engel, ed. Evolution of the insects. Cambridge Evolution Series (illustrated, reprint ed.). Cambridge University Press. p. 97. ISBN 978-0-521-82149-0. ↑ "Extreme Animals - Astrobiology Magazine". Astrobiology Magazine. 2002-09-01. Retrieved 2018-02-12. This page was last changed on 6 February 2019, at 14:51.